Materials that have a very high boiling point or are prone to thermal degradation should be distilled under vacuum. In these cases the distillation can be performed under vacuum. Vacuum has the effect of lowering the boiling point and removing oxygen. The lower boiling point helps to distill high boiling materials more easily. In turn the lower boiling point puts thermal stress on samples prone to degradation. The removal of oxygen further helps to prevent oxidation of less stable materials during distillation. The relationship between reduced pressure and boiling point requires a calculation. Fortunately, a program that can calculate the boiling point of a material at various reduced pressure is available here. 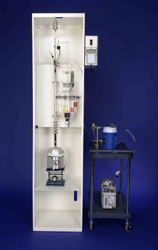 B/R offers an automatic vacuum option (VAC-1000) for its distillation systems. This option allows automatic vacuum control of distillations. D1160 is a vacuum distillation method according to ASTM. This ASTM test is primarily for higher boiling petroleum products such as diesel, bio-diesel, middle distillates and heavy distillates. 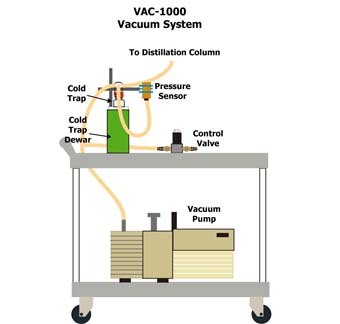 More on D1160 vacuum distillation.